Huge thank you to everyone who attended the retail class on Friday, fab day and hopefully lots of new exciting businesses will be setting up that we can all buy from and get excited about. Busy weekend not used to having two day off but SaturdayÂ brought a car (finally) nothing fancy just a jeep thatÂ allows quite a bit of stuff from buying trips to be shoved in the back and on Sunday in the pouring, bucketing down rain a walk in Hampstead Heath. I love walking in the rain no one else does mind thenÂ I spent some time catching up on chores, big fire and a flick through Yotem Ottolenghiâs & Sami Tamini’s latest book Jerusalem which I love. Not only are the recipes fabulous you getÂ an insight into the city, its people, the smells, the culture a very good read indeed, not forgetting that two people one who grew up in the Jewish west of Jerusalem (Yotem) and one who grew up in the Arab east (Sami) are friends, business partners and purveyors of the coolest food. Food brings people together they say, nothing truer than that! With a chill in the air nothing makes me happier than snuggling on big leather chairs, draped in sheep skins reading, Cosyifying your house for winter is pretty easy and fun too. I go a little mad with t-lights, they are now plonked on mantles, side tables, consoles so when the light falls they literally come into there own. 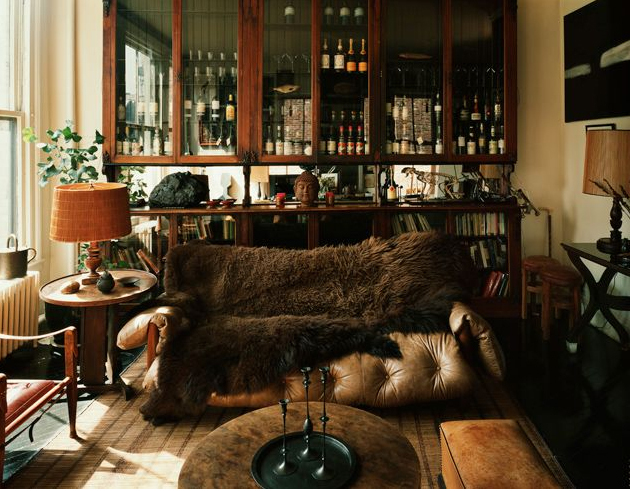 Also I am a big fan of sheepskins draped over sofas, chairs they just add that extra layer of cosiness. Iâve gotten mine at fleas, and through a website which I’ve forgotten but if you Google I am sure it will come up of organic sheepskins. Mung’s and Maud love love love them we have to fight who gets the sheepskin chairs. Any kind of rug that is woollen, slubby skimming the floor cosies up a space, plus I am a big fan of foliage, berried ivy, ecuplutus, herbs like rosemary and thyme dotted around the place immediately shout winter. I couldn’t live without a fire, come 4 oâclock ish, back from a saunter over the park with the two MâsÂ when the light is at itsÂ softest I light one in my studio – and then downstairs for supper another one. What I am really trying to say in a very rambling fashion is that we shouldn’t fight winter we should embrace it, yummy one pot kind of foods, and lots of flickering candles, slubby cushions, and good books. Agree? Must dash trying a new yoga place at the top of the road, if I don’t enjoy that goodbye yoga (forgive any spâs no time to read thru)!